1. Preheat oven to 425. Prepare the squash: cut in half, remove seeds, and brush cut side with oil. Place cut side down on baking sheet and bake for 45 minutes, or until soft. Let cool to where you can touch it. 2. Melt butter in large put over medium heat. Add onion and sauté until tender, taking care not to burn or brown. 3. Scoop out squash flesh and add to pot along with thyme. Bring to boil, then reduce heat, cover and simmer until squash is very tender, about 20 minutes. 4. Using immersion blender, puree soup until smooth. Alternatively, carefully pour into blender or food processor and puree. Serve hot with croutons. Arrange bread slices on baking pan and drizzle with olive oil. Broil until golden, about 1 minute. Remove from oven and turn over. Sprinkle with cheese and return to broiler for about 1 minute until cheese melts. 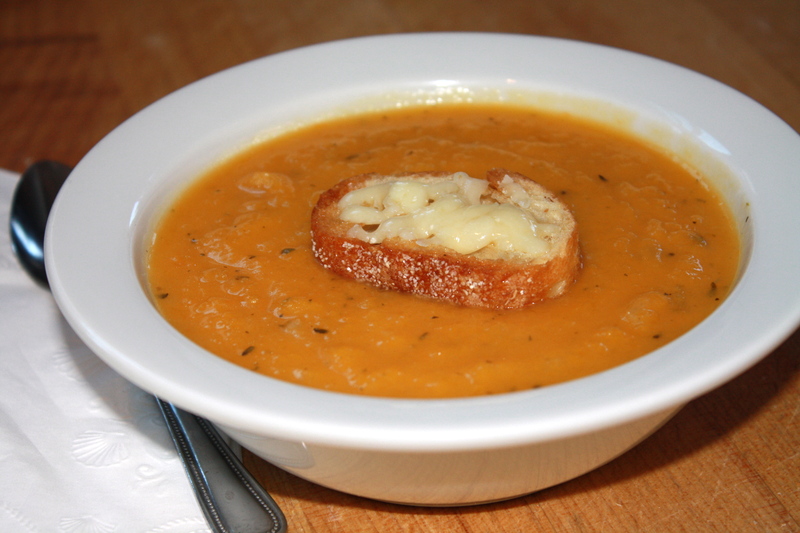 This entry was posted in cheese, soup, Sweet Life Laur Original, vegetables, wine and tagged bisque, butternut squash, cheese, croutons, gruyere, soup, wine pairing by Laura Zolnoski. Bookmark the permalink.